Brown MOAC oiled cotton jacket with zipped and studded front. Two studded front pockets. Drawstring hood and waist. 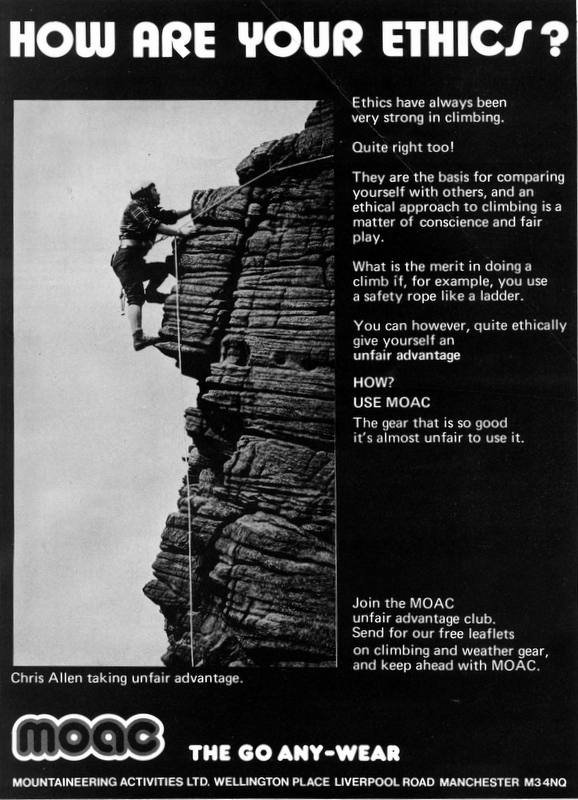 M.O.A.C is a shortened version of MOuntaineering ACtivities which was part of the Ellis Brigham outdoor retail empire back in the 1960/70's. A mountain guide called Peter Gentil ran the activity side of things while Bob Brigham did the equipment, though it seems that both of them did both at various times and they famously colluded with another mountain guide, John Brailsford, to produce one of the world's first artificial chockstones - the MOAC. 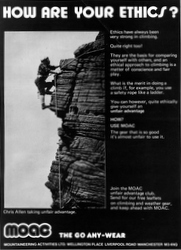 Not quite sure, but it seems that MOAC (the company) was the import/ export division of Brighams and we are sure they marketed, and sometimes made, a whole range of outdoor equipment including tents, climbing gear and clothing. We have an excellent example of a MOAC shirt elsewhere in the collection and an unusual MOAC jacket here. 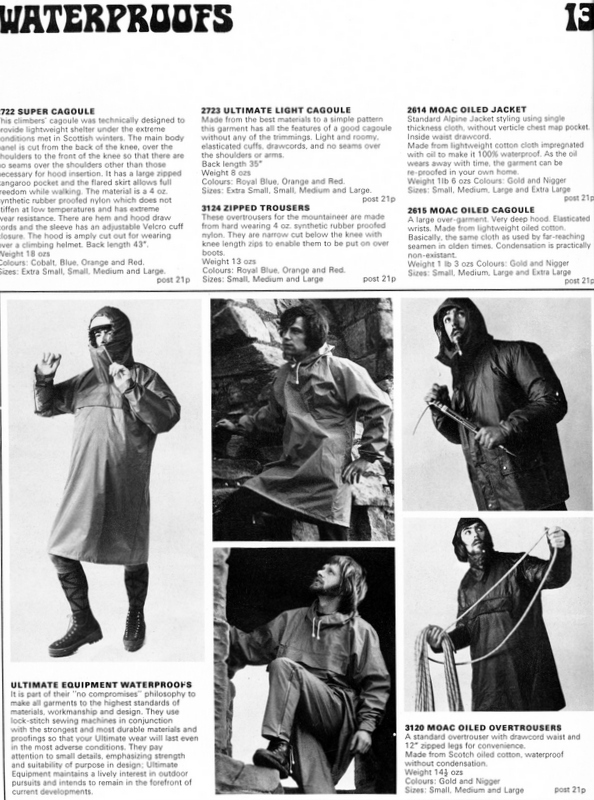 Various materials were jockeying for position in the market before gore-tex arrived and oiled cotton was one of them. It had served fishermen and sailors well for centuries and it was thought it might do the same for mountaineers.MOAC came out with two versions in the early 1970's appearing in the Ellis Brigham catalogue opposite circa 1975. It's the cagoule version we have here which would have cost you just £8.00 back then. A lady called Margaret Berwick kindly donated this iconic jacket to the collection in 2015, though we think it might have been her husband's - thanks anyway.